Organised by the Balearic Yacht Brokers Association, in partnership with MYBA, the second Palma Superyacht Show takes place from April 30th to May 4th. With a record 55 yachts on display  both power and sail  this represents an ideal opportunity to see what the Mediterranean yacht brokers have to offer interested buyers. Here we select five of the yachts on display and currently for sale. 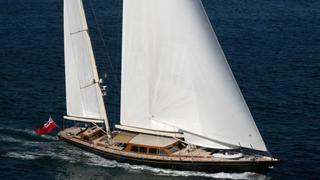 One of the largest yachts on display, the 48.4m sailing yacht Thalia is offered for sale by Yachtzoo asking $14 million. 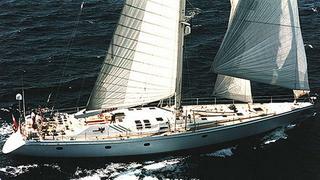 Designed by Ron Holland, she was built by Hollands Vitters Shipyard and delivered in 1994 with a complete refit in 2008. A spacious main deck saloon with panoramic windows opens out to a large sheltered deck area with a retractable blind. Expansive mahogany panelling and marble showers in the staterooms contribute to the boats elegant and stylish interior ambience. The interior design is by Elmar Meurer, and she accommodates 11 guests in a master suite and four twin staterooms plus two Pullman berths. Yacht Connections is bringing the all-aluminium 46m expedition yacht Dione Sky to the show, priced at $17.5 million. Custom built in the US by Palmer Johnson to ABS class, she was launched in 1996 as Turmoil. Under her present owner she made an impressive figure of eight passage around North and South America  a feat recognised by the award of the Voyagers Trophy at the 2011 World Superyacht Awards. In all, she has logged nearly 200,000 nautical miles since launch and made a successful transit of the North West Passage in 2001. Her rugged appearance belies a stunning, elegant interior in American cherry wood. MCA compliant, Dione Sky has accommodation for 10 guests in a master suite, two double staterooms and two twin cabins, all en suite. She received an extensive refit/rebuild in 2007. Twin 819hp Caterpillar engines give her a cruising speed of 12 knots and a range of 7,000 nautical miles. Both engines were completely rebuilt in early 2013 meaning that Dione Sky is now ready for more worldwide adventures. McMaster Yachts has joined forces with Burgess to showcase the 40m sailing yacht Tenaz priced at £4,995,000. Tenaz was built as Mamamouchi by British yard Pendennis to ABS class and MCA compliant and launched in 1996 with an extensive refit in 2010. 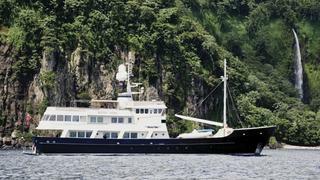 She went on to win the Voyager award at the 2010 World Superyacht Awards. Tenaz is offered in immaculate condition with all the benefit of a refit where the mechanics and infrastructure have been comprehensively upgraded and replaced where necessary. She has a sleek profile which gives wonderful visibility forward from her huge cockpit and has earned a superb reputation for her performance under sail. 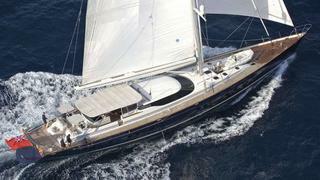 Fraser Yachts will be displaying the 30.48m sailing yacht Garuda, currently for sale at 1.55 million. Her naval architecture is by Ron Holland with styling by Jon Bannenberg and she was built as an ABS classed Swan 100 model sailing yacht by Nautors Swan with a launch in 1986. This 165 ton superyacht can accommodate six guests in one master and two twin cabins, while a 550hp Mercedes-Wizemann diesel engine offers a cruising speed of 10 knots with a maximum speed of 13 knots. Garuda was refitted in 2012 including a fresh paint job and has had only light use since. Ocean Independence and dahm international are exhibiting the 29m sailing yacht Scorpione dei Mari, listed for sale at 5.45 million. 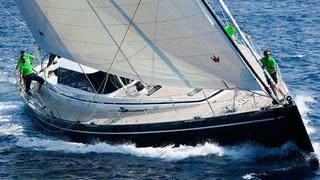 She was built in aluminium by Jongert to a Tony Castro design and launched in 2005, becoming a proven regatta winner. Accommodation is for up to seven guests in an owners cabin and two twins with a Pullman berth. As a bonus, she comes complete with a full racing and cruising sail inventory and has been well maintained throughout her history, receiving a full paint job in 2011. Handling aboard Scorpione dei Mari is made easy, even with a small crew, due to her configuration with a Hall Spars carbon mast, Park Avenue carbon boom, lazy jack slab reefing, PBO rigging for the inner forestay and backstay and Harken carbon racing winches including a captive winch for the mainsheet. She can be sailed from the double steering position behind the cockpit from where there is easy access to the stern swim platform. All cruising functions are also comfortably controlled from the navigation area in the inside cockpit, giving 360° degree visibility across the yacht.